In most metropolitan cities around the world, you would most probably see your fair share of “phone zombies” – that is, folks who walk around to their destination, and yet having their eyes firmly glued over to the smartphone, as though they were moving around using their peripheral vision alone. Phone addiction is a very real problem, and we do know that well meaning actions can be painful at times. 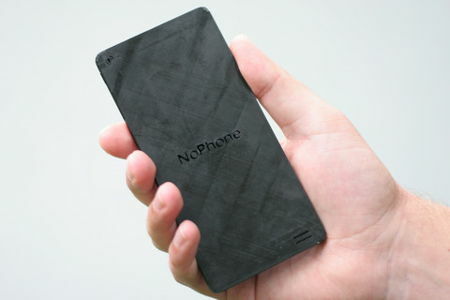 If you know of someone, or you yourself would like to be less dependent on your smartphone, here is the NoPhone that might just do the trick. It looks like a smartphone, bearing a somewhat generic form factor and weight, but other than that, it does nothing. It occupies space in your pocket, you do not have to worry about the “screen” cracking when you drop it – nothing of that sort at all. It is meant to help you feel as though you’re carrying a phone, and that’s that, hence the name. Even better is, it is battery-free, and you can finally have real conversations in person to another human being physically over dinner.